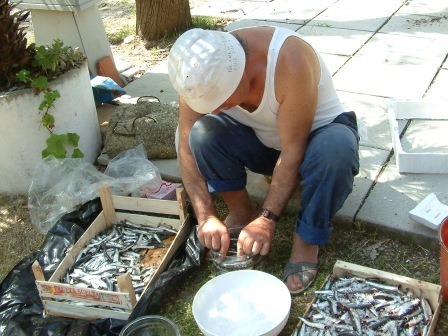 One day Salvatore arrived with several polystyrene crates of locally caught silvery “alice”, better known to us as anchovies. He wanted to show us how these could be preserved in salt. The previous day he had already prepared one boxful, but he demonstrated the whole procedure with the contents of the second. He commenced by decapitating the little fish by pinching below the gills using his fingers and nails and then with a gentle twisting action teasing out the entrails. I just observed, squeamishly, while Paul decided to have a go, while Salvatore vigilantly watched on. It soon became apparent that this task was not as easy as it first appeared, but little by little Paul seemed to master the task. The fish were then sprinkled with coarse granules of sea salt, and left for 24 hours – this procedure was to absorb much of the blood and to help soften the fish. The following day the fish would be ready for the next process. Salvatore then appeared with the crate of fish that he had prepared the previous day. 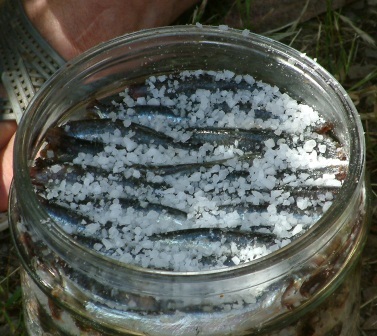 He now took some large, wide necked glass jars, and sprinkled some sea salt into the bottom. He then proceeded to carefully create a layer of the little fish, placing them in a head to tail fashion. When the first layer was complete, in went another handful of salt, followed by another layer of fish. This process was repeated several times until the container appeared to be full. Then Salvatore took out his penknife and cut some circles of polystyrene which just fitted perfectly into the neck of the container. 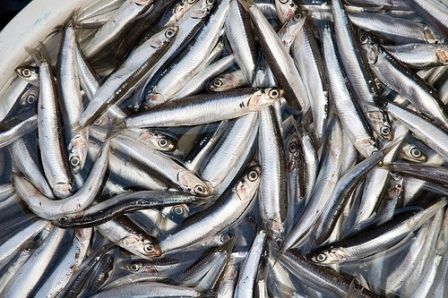 A heavy weight was placed on top for an hour or so, which compressed the fish down, closing any air gaps, so that finally yet another layer of fish could be added with more salt scattered over the top. These containers were then to be left for a week or so, and we were told that then the old salt and any liquor had to be removed before replacing more fish in new layers of salt. This was a similar curing process to that used by Cornish folk of yore, when huge nets were used for the pilchard catch, and the fish were salted in huge barrels called hogsheads. Salvatore had kept a few fish back and grilled them for lunch on his BBQ, the delicious wafting aroma was truly exquisite. They were scrumptious, served piping hot with a drizzle of olive oil and a generous squeeze of lemon, washed down with a glass or two of Salvatore’s home-made “vino bianco”. “Perfetto” !!! We resolved to go down to the Gaeta fish market soon, to visit Salvatore’s brother who was a fishmonger. Salvatore assured us that his fish was always the best and very fresh, as Salvatore described it: “the fish are still talking to you!”.